When one talks about baked camembert, one has to be straightforward: It is simply delicious, period. For me, it’s a very sophisticated, elegant dish. Homey and comforting because of its puff pastry outer shell. 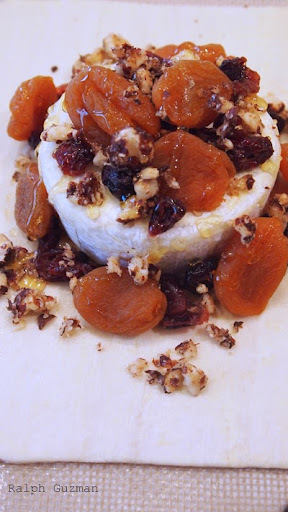 But inside — all the richness of cheese, fruits, and nuts. 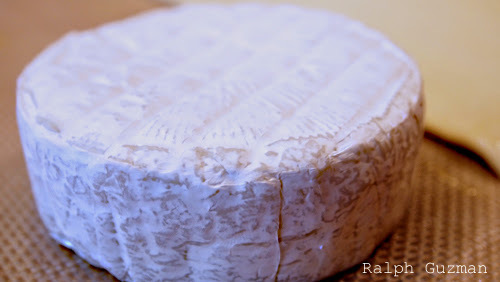 Camembert: I love this cheese. It’s creamy with just the right hint of saltiness. Love using it with crackers, in salads, pasta, and of course, this recipe. Baked camembert — camembert en croute in French — is one of the many wonderful things one can do with puff pastry. En croute indicates food wrapped in pastry dough. Insofar as baked camembert is concerned, it’s normally served as an appetizer, although I have met many people who have eaten this as dessert. Save the best for last, as they say. When camembert is not available, many people use brie instead. So, feel free to make baked brie — brie en croute — should camembert be unavailable. The recipe, sophisticated as it looks, can seem daunting to us ordinary cooks. But as I discovered, if you have the right ingredients, you can make it in no time while still impressing your guests and loved ones just as much. I realize the most difficult part of the is the puff pastry. 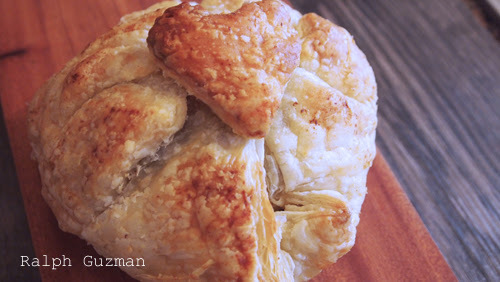 For me, it’s worth the time to make it because the buttery taste and flaky texture are just marvelous. So yes, one can always make it from scratch. But from my own experience, this can be quite tedious, and there are thousands of recipes out there. So let’s be practical. Who has the time and the patience? And what if your guest is already coming within the hour? My solution is to just buy the frozen ones from the supermarket. In the past, I would see them in thick rectangular blocks, which you would still have to thaw and use a rolling pin on. But finally, my favorite supermarket sells puff pastry in thin sheets, which are just perfect. No more using the rolling pin! No more messing up the counter! I bought a pack of 5 sheets, and I just needed one sheet for this recipe. The rest? I can’t wait to use them for other recipes. Coming from the freezer, I just let the sheet of puff pastry thaw for a few minutes until it becomes pliable. 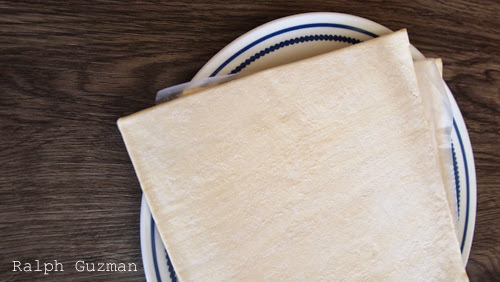 I put the camembert wheel onto the center of the sheet, which is about 8 by 8 inches. Now, to make it truly delicious: add dried apricot, cranberries, and chopped hazelnuts. You can go for fresh fruits if you want. By the way, I used hazelnuts, because they were the ones available at the time. They tasted very good, though more people use walnuts. I drizzled the top with some honey. I’d also suggest adding figs or fig jam for extra flavor too. I then proceeded to wrapping the cheese. I started by bringing the corners of the puff pastry to the center of the cheese, until I was able to come up with a decent wrapping– I admit that plating is a skill I’m still working on. All things considered, wrapping was very easy– much easier than wrapping gifts for Christmas. 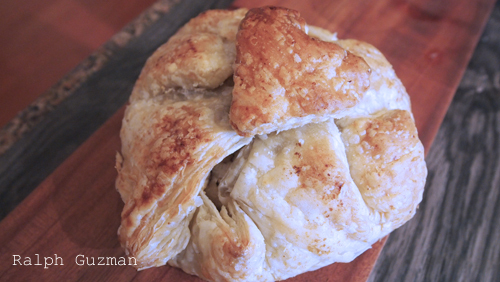 To make the dish a little more visual, I created a heart out of pastry using a cookie cutter. I thought this was perfect for our friends, who had recently gotten engaged when we served this. I actually wanted to do an XOXO pattern, but it looked somewhat tacky, so I ditched it. Hahaha. Now, puff pastry already has a lot of butter, but I still insisted on lightly brushing the surface with butter. This is to ensure a toasted and crunchy exterior. Bake in the oven at 175C or 350F for about 15-20 minutes or until golden brown. For best taste, eat it warm. Do try it today. It is a very easy dish. Enjoy! Baked Camembert: Cross Section shows melted camembert. 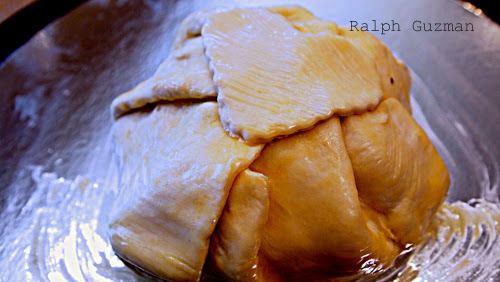 It is, however, able to maintain its wheel shape because of the puff pastry. 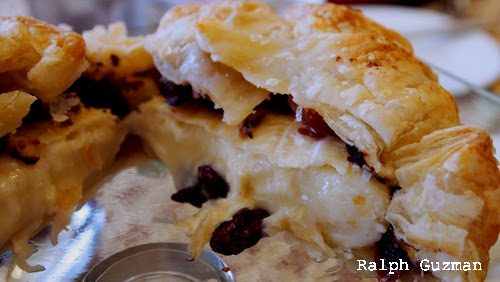 This entry was posted in Food + Recipes, Salad + Appetizer and tagged Appetizer Recipe, Baked Brie Recipe, Baked Camembert Recipe, Camembert En Croute, En Croute Recipes, French Appetizer Recipe, Puff Pastry Appetizers, Puff Pastry Recipes, Recipes with Puff Pastry by Ralph. Bookmark the permalink.